Other CCIH members responding include IMA World Health, WaterStep and World Relief and the Baptist Church in Central Africa. IMA World Health received funding from the Office of U.S. Foreign Disaster Assistance (OFDA) to support its response efforts. In partnership with local communities, IMA World Health ensures health workers have the equipment and resources they need and reach at-risk health zones. “IMA’s support of local organizations and communities strengthens government-led responses and helps ensure that the improvements continue beyond the crisis,” said Dr. Larry Sthreshley, a Presbyterian Church (USA) missionary and IMA’s DRC Country Director, based in Kinshasa. WaterStep sent 15 Bleach Makers to the DRC in October to provide medical grade bleach to kill the Ebola virus. The portable Bleach Maker is a handheld device that can generate powerful disinfectant on demand. Using water, salt, and a 12-volt car battery, the Bleach Maker uses a process called electrolysis to create sodium hypochlorite, more commonly known as chlorine bleach. The Bleach Maker was developed in response to the West Africa Ebola outbreak in 2014. World Relief is responding through its country program in the DRC with an extensive awareness and primary case management training program in the Church Empowerment Zones in North Kivu and Ituri provinces and so far have sensitized and trained over 73,000 people. The Baptist Church in Central Africa (CBCA) responded to the latest outbreak of Ebola in Beni and Lubero in the Democratic Republic of the Congo (DRC) by installing hand-washing stations at churches, schools and other public places, engaging religious leaders in educating the community, training 60 local educators, and through the use of flyers and megaphones to share messages on hygiene and how to avoid spread of the virus. The project was supported by Tear Fund Canada, CBM Canada (Christian Blind Mission), and the United Evangelical Mission and lasted three months in late 2018. CBCA focused its efforts on the areas of Beni, Mangango, Visiki, Maboya, Busaghala and Katwa. The educators were trained to counter many rumors, such as the virus was invented for political gain, and burial teams desecrate the bodies of victims before burial. A total of 657 people (including pastors and community members) participated in the training. Trained pastors included messages in their Sunday services in at least 95 parishes. In Butembo and Beni, the average parish membership is 500 to 700 people and in the rural areas it is 200 to 400 people. With an average of 450 people per parish, CBCA believes the message may have reached at least 42,750 worship participants. Since the rural population regularly listens to the radio, two stations covering the territory of Beni were used for educational broadcasts. As of November 18, 2018, there were 326 confirmed cases and 169 confirmed deaths. If you or your organization is responding to the Ebola outbreak in DRC and have observations, comments or requests to connect with others working there, send a message to the CCIH Ebola Google Group. Contact Kathy Erb at kathy.erb (at) ccih.org with questions. 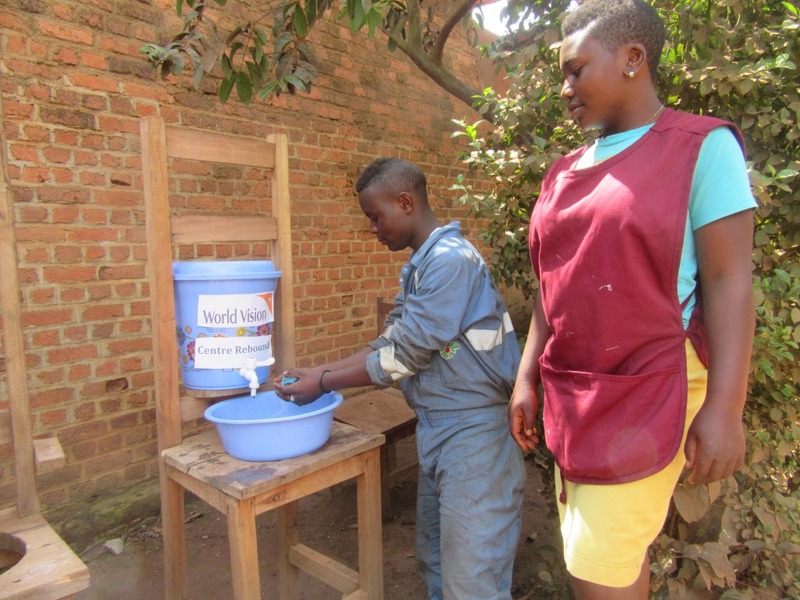 Above photo: Handwashing Station in the DRC, courtesy of World Vision.